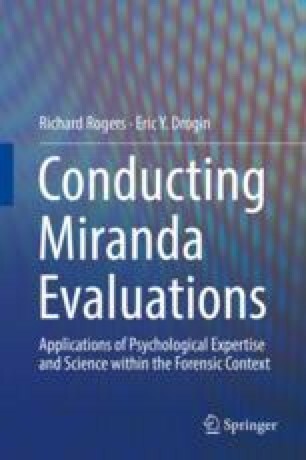 This chapter provides an overview of Miranda v. Arizona and other appellate cases of significance for the proper and effective performance of Miranda evaluations. Its focus identifies and supplements the legally oriented knowledge base needed by forensic practitioners in evaluating Miranda warning content, Miranda rights knowledge, as well as the validity of Miranda waivers. Forensic practitioners need to bear in mind that their evaluations are only valuable to the extent that they respond to the criminal justice system’s need for scientifically informed answers to specific legal questions. An understanding of the requirements, priorities, and implicit boundaries of the criminal justice system is critical in providing services that will be welcomed, understood, acknowledged, and utilized by the courts. American Academy of Psychiatry and the Law. (2005). Ethics guidelines for the practice of forensic psychiatry. Retrieved from http://www.aapl.org/ethics.htm. Justia. (2018). Miranda v. Arizona. Retrieved from https://supreme.justia.com/cases/federal/us/384/436.